Are you searching for a diy Project you can actually do yourself? 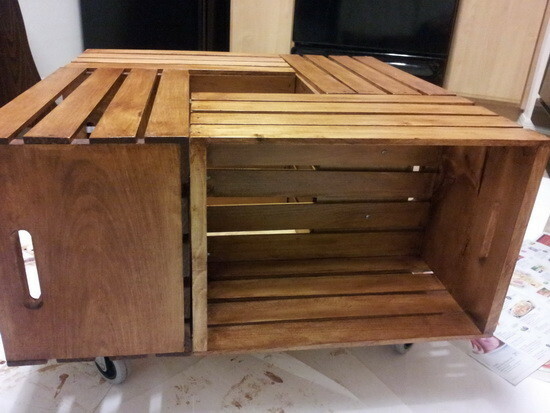 This woodworking project is a fun and a fairly easy one to tackle on your own. 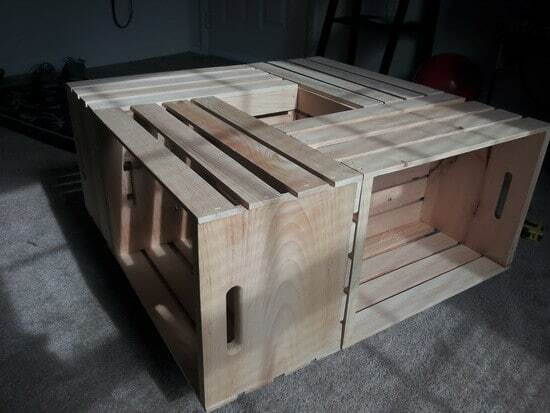 The Wine Crate Coffee Table is a great way to recycle old soon to be thrown away wine boxes and crates. 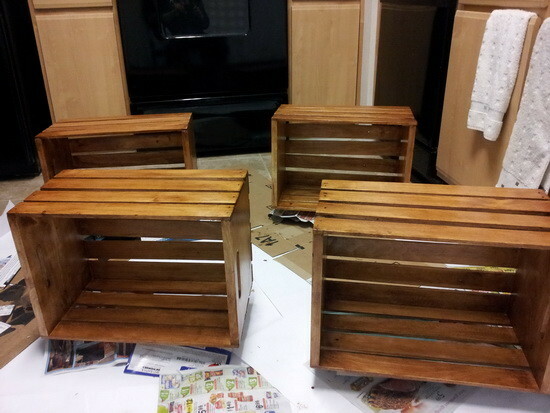 Don’t have any wine crates just lying around? We got our wine crates for $5 each. We found them after the Christmas season as they were leftover from the huge holiday sales. We suggest calling around to the big franchise type liquor stores or wineries if you have them in your area. Craft stores will sell crates like this too. Print out a coupon online and you can get them for 40% off. At a local craft store they will be between around $15. Here is a wood crate you can buy at Michaels that will work just fine. Here are all of the materials used spread out to see everything. 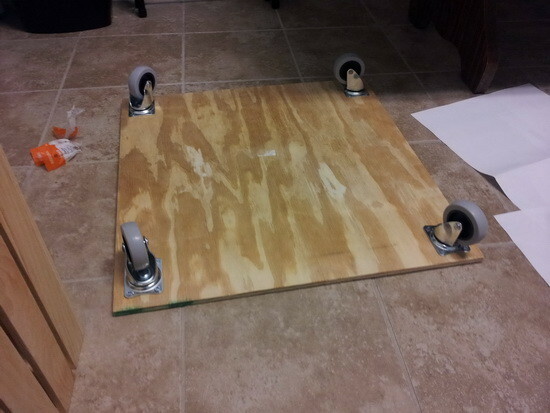 Here are the wheels (casters) screwed into the plywood base of our table. 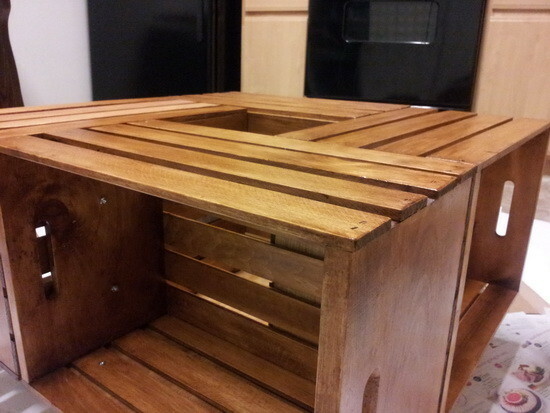 Here are the wood pieces all bolted together to make sure it fits. 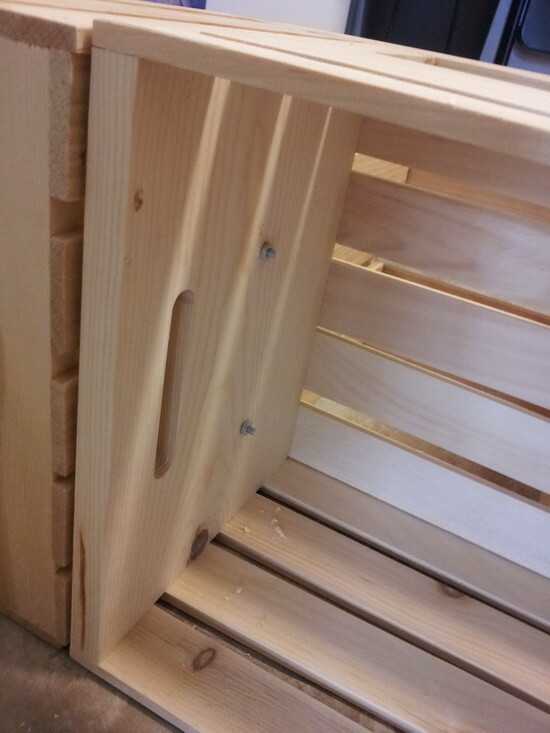 The bolts are attached to our wood and holding it together. Here is our coffee table in place to make sure it fits. Here is another view of our table where it will be used. A side view of our table with the wheels on. All of our coffee table pieces ready to be stained. A few sections of our table that have been wood stained. All of our wood pieces and sections fully stained. A few sections turned out a little darker than the rest. 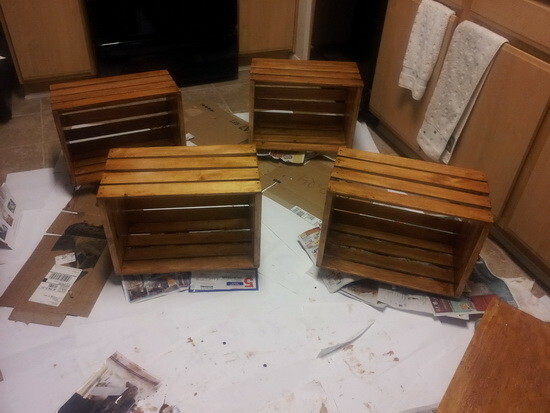 We applied the second coat of stain to all of our wood sections. Third coat of stain applied and all colors match now. All wood sections fully and nicely stained and waiting to dry. 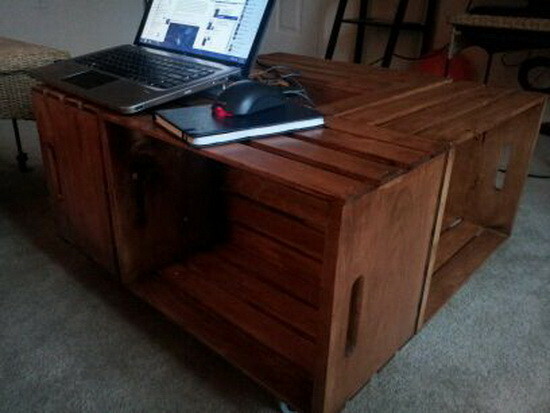 Here is our coffee table stained and put back together. 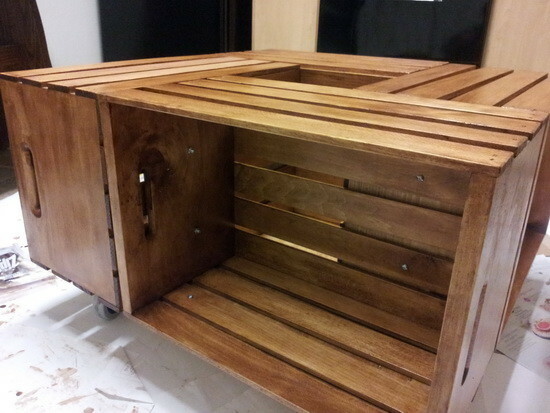 Here is our wine crate coffee table completely finished after around 15 hours of work. Here is another angle of our table stained and finished. Notice how well the table will be for storing items such as books? 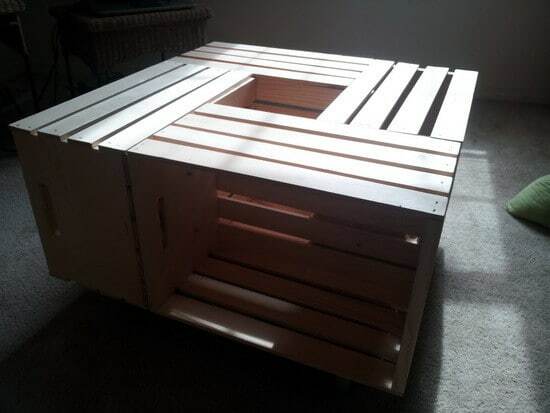 Here is our diy Wine Crate Coffee Table Finished and in the living room! 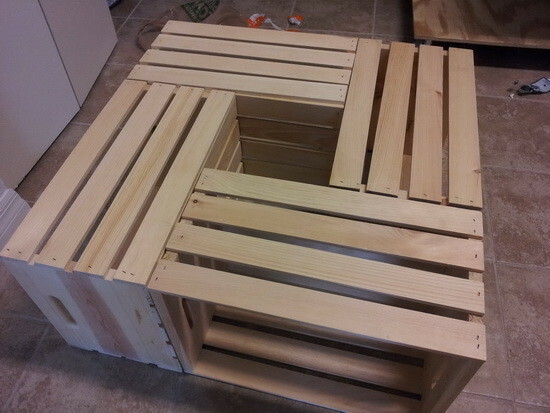 That’s a beautiful table… I’m trying to make one such and have purchased the crates. Could you please tell me more about the casters (make/where to buy) and also the length of the bolts to use? You can use any size casters you choose. Amazon sells casters and so does any home improvement store. When you choose your casters, then choose the bolt size. I have an old Craftsman table saw that I would like to use as a base to make my own pub table. I want to use the table saw as the base, Any ideas? It was my husbands fathers, and my husband doesn’t want to get rid of it, but it doesn’t work so I thought it could be “reused”! Repair any chunks taken out of it with wood filler. Let dry. Sand the complete table down. 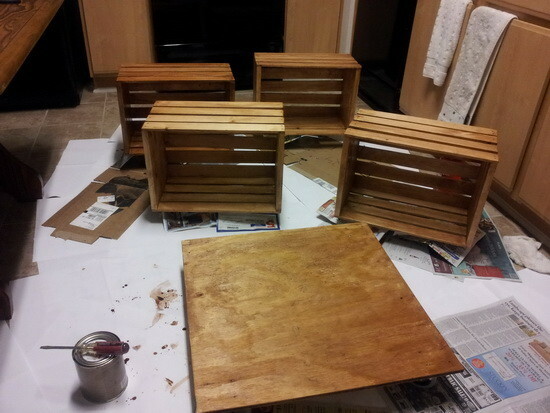 Then stain with wood stain and varnish if desired. 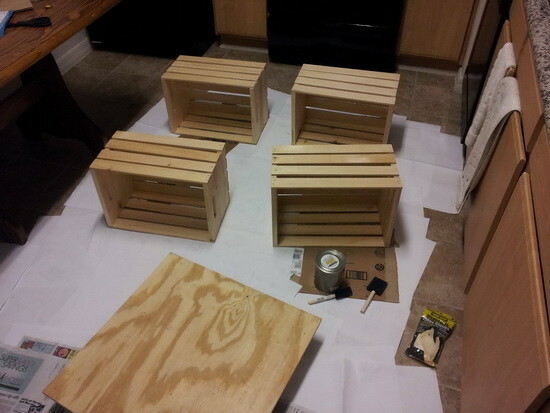 Did you drill holes for the screws/bolts to attach the crates to one another? I’d like to make this, but I don’t have & am not willing to buy a drill. 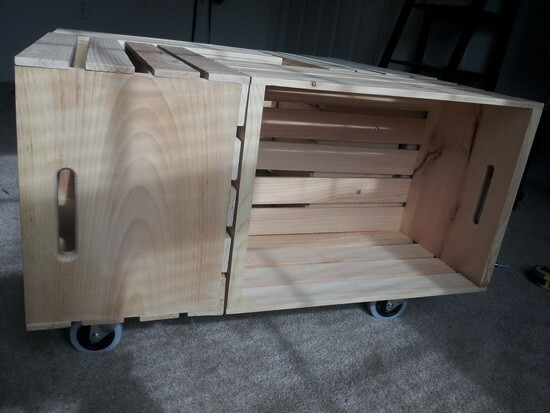 What thickness is the plywood and what size are the casters and what size are the bolts used to fasten the crates together? 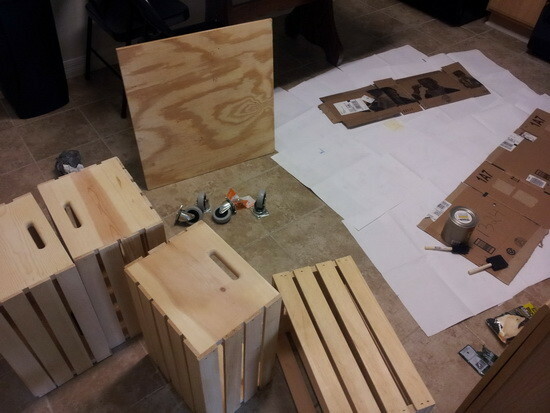 How are you attaching the wine crates to the plywood? 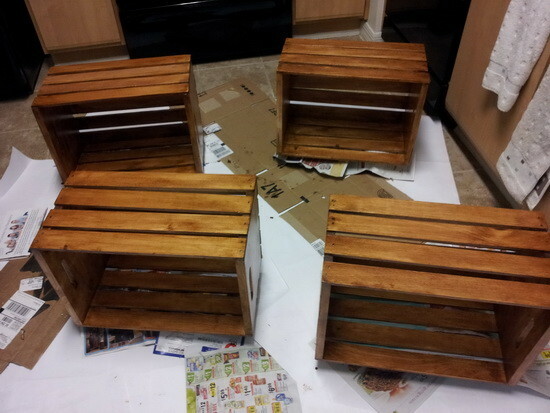 I am about to do the same table but with mini fruit crates. I thought about gluing them to the plywood and even gluing them together an a small bolt. The wood is thinner on fruit crates . For that hole in the center, why not fill it in with a changeable decoration of some kind? An Easter decoration….then after Easter, a fake plant maybe…. change it with the Holidays…..
We love the coffee table and are planning to make it but need to now if there is something in the middle of it holding up the cork and the plant in the finished piece? We love that touch and want to have that as a piece of our table to! Thanks so much for the inspiration! You don’t have to use the casters right? I could just have it lay on my carpet? And if so would I need to get the ply wood? No you do not need the casters on the bottom of the coffee table. The whole table can sit right on the carpet with no problem. Why “5” casters? Did you put one in the center that isn’t shown. Yes, one in the center to support the weight. 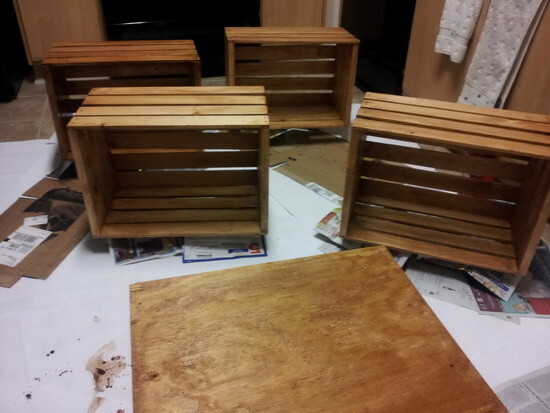 What size are the wine crates that you used? We used the biggest wine crates we could get our hands on. Each wine crate has the dimensions of 19 1/2″ L X 13″ W X 7″ H. They are 12 bottle crates and are made to hold 12 750 ML wine bottles. The bigger crates are mostly branded on the front sides, the 13″ W part. Where did you get your wine crates? 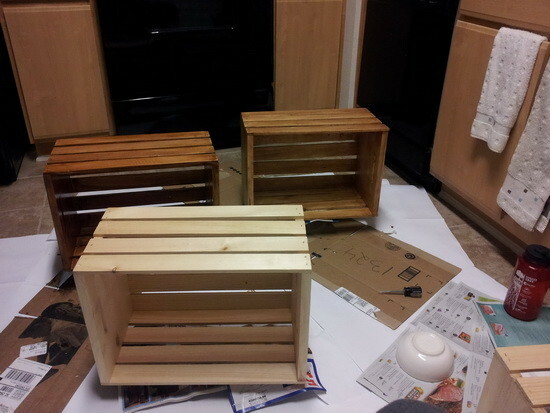 Wine crates can be obtained from your local Michael’s craft store, Goodwill and even Ikea. You can also try calling your local wine store and asking them if they sell them at a discount too. 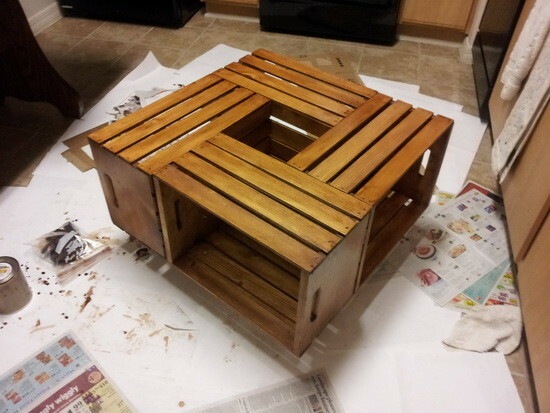 Did you use brush or rag to stain…BTW, this is an awesome inspiration. In Poland? I would assume you can get them where they sell wine. Or order one online. Try ebay. Or put a want ad for wine crates on craigslist. Would you please tell me the size of the bottom piece of wood you used to attach the castors to? Thanks so much! Great photos! The bottom piece of wood is 4ft. Originally we were going to make the bottom piece where the casters bolt on 3 feet 6 inches. We decided to make it larger to fit our living room better. We will add the picture soon of our coffee table finished in the exact dimensions soon.